Advantages: Good basic coverage of the Mk V and expansive walk-around. If ever there was an icon of the RAF in WWII, it would have to be the Spitfire Mk V. With nearly 6,500 having been produced and having been flown by pilots from nearly every combatant in the war, the Mk V would have to be one of the most easily recognizable and well known aircraft of the war. While there are any number of excellent books on the Spitfire in general, including the weighty “Spitfire – The History” (aka “The Spitfire Bible”), I cannot recall a good basic coverage of each of the individual marks. It is just such absence that makes the new Mushroom Model Magazine Special such a welcome addition to the literature on the Spitfire. As is the case with other MMM Specials, this monograph is logically arranged. There is an overview of the development of the Mk. V including a description of the variants, such as the VA, VB, VC, LFV and so forth. There is also a listing of serial numbers by production facility, the version and delivery dates. The next section deals with the operational use by the RAF. But this is really nothing more than a compendium of squadrons which flew the Mk V, the codes of those squadrons and the operational dates for their use of the Mk V.
The various camouflage schemes applied to the Mk. V in RAF service are then discussed. This includes a discussion of the Malta Spitfires ( A subject near and dear to me.). While Matusiak seems to come down on the side of an unknown dark gray for Operation Calendar aircraft, he does qualify his opinion and leaves the door open to other possibilities. What is most valuable is that the book has a well reproduced color picture of BR112 (Yellow X) after it crashed in Sicily. This aircraft was in the Operation Calendar delivery in April ’42 and was one of the Spitfires painted aboard the USS Wasp. I still vote for a dark, dark blue. The book proceeds to list all the foreign users of the Mk V, and, where appropriate, describes any applicable camouflage and marking variations. Mr. Matusiak then gets “technical” by providing a brief overview of the construction of the Mk V, including all the appropriates specs. However, one thing bothers me. He provides drawings of the wing structure, both top and bottom, for the A, B and C variants. But for the C wing, there is no indication of the breach bulge on the top of the wing. Yet, the bulges are shown for the B wing. This could result in quite a bit of modeling confusion. There is then a full color photographic walk-around. Mr. Matusiak carefully qualifies the pictures by stating that not all the aircraft photographed were built as Mk Vs, but the pictures were chosen to depict those aspects appropriate to the Mk V in wartime service. A couple of points worth noting: The picture of the cockpit shows a black seat, but one can see that the original rust-red was most likely over painted. Also, Mr. Matusiak seems to indicate that the red crowbar on the cockpit access door is a modern affectation, and that the original wartime crowbar was either natural metal or RAF cockpit gray-green. The book concludes with a number of profiles, but no real surprises here. Some final points. For those who want to do a Mk V in D-day stripes , there are two excellent pictures. One of a VC, AB509/ J*MC belonging to W/Cdr Johna (sic) M. Checketts. The other is of a VB, BL591 / BA*U (over score on the U) of 277 Squadron. Then there is the issue of those odd cowling and tail-plane white stripes (four wrapped over the cowl and two on each tail-plane) that appeared on a number of Spitfires in the summer of ’42. In two separate statements, Mr. Matusiak indicates that these were applied by virtue of a Fighter Command signal of 5 July, 1942 and removed by a subsequent signal of 17 July, 1942, and that such markings appeared about the time of the abandoned Operation Rutter. It would have been good if he could have been more specific as to whether these were experimental makings in general, or developed in connection with the proposed operation. He states that these making had nothing to do with Operation Jubilee. 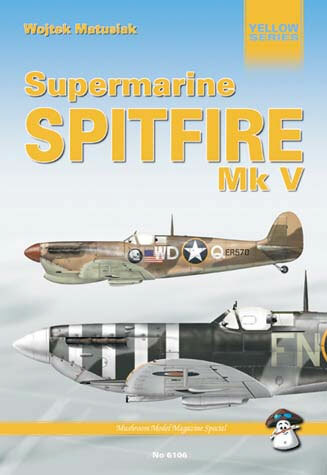 While some Spitfire boffins may consider this volume too basic, the Mushroom Model Magazine Special on the Spitfire Mk V is a commendable addition to any modeler’s library.